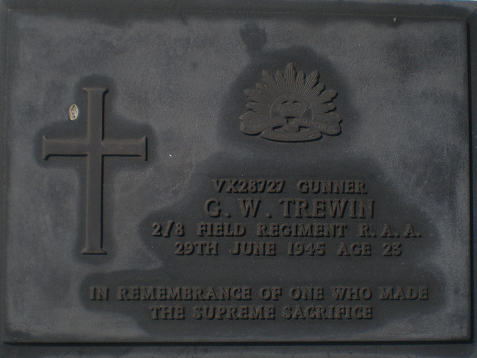 George Trewin was born at Oakleigh in Victoria on 13.01.1920 and he lived there at the time of his enlistment at Caulfield Racecourse on 19.06.1940 at age 20. A single man, he was a Motor Mechanic and Driver in his usual occupation. He was originally posted to 2 A/A Regiment on 21.06.1940 and Graded Group 3 – Motor Cyclist on 26.09.01940. This was reversed on 14.10.1940. On 05.02.1941, George embarked at Melbourne with the 2 A/A Regiment, later disembarking somewhere in the Middle East on 17.03.1941. He later lost seven days pay for disorderly conduct. On 08.09.1941, he was evacuated to 62 British General Hospital with a fractured humerus and spent some time in convalescence. He eventually returned to his Unit on 27.01.1942, from there being transferred through 1 Australian Artillery Training Regiment; 1 Australian Depot Btn. ; later the AIF (ME) Staging Camp on 01.08.1942. he was taken in strength by 2/8th Australian Field Regiment on 07.08.1942. George was again evacuated to 7 Australian General Hospital with Infectious Hepatitis and then transferred to 4 Australian Convalescence Depot on 18.11.1942. He finally returned to the Unit on 28.12.1942. He embarked in the Middle East on “L4” on 31.01.1943 and disembarked in Melbourne on 25.02.1943. By 07.08.1943, George was declared medically fit for all duties and returned to the Unit. Granted Proficiency Pay on 19.10.1943, he was later Graded Group 2 Signalman on 31.10.1944. On 06.05.1945, the 2/8th embarked from Townsville, Qld aboard USNS “David C. Shanks” arriving on Morotai Island on the 16th. From there they were transferred by LCT to various points on the west coast of North Borneo & Brunei. On 28.06.1945, 25 years old George William Trewin became a Battle Casualty - WIA with a rifle wound to the abdomen. He was placed on the dangerously ill list on 28.06.1945 but sadly died of wounds on 29.06.1945. George was buried in Brunei on 30.06.1945 – Grave # 4. 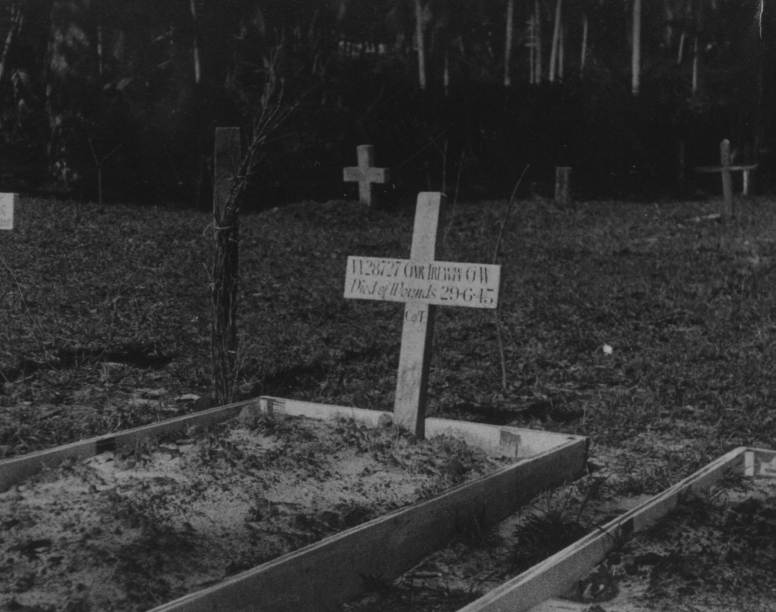 On 13.09.1945, George’s remains were reburied in Plot # 3 at Labuan Cemetery. Grave of George William Trewin. A detachment of which I was second in command were engaged with a party of Japanese. On 28.06.1945, “Stewie” Moore was standing next to me when he dropped dead. The Lieutenant on the other side of me later discovered a bullet hole through the top of his slouch hat, whilst I in the middle was unhurt. Two were badly wounded in the same engagement, George Trewin & another Signaller. George was calling out to me by name. I crawled out to find him terribly wounded by machine gun fire – sadly fired by our own troops – I had been calling out to them to “Stop Firing !”. When I got him back to our position I heard another call from a different direction, so I headed out again & found a Gunner, who I didn't know, who was screaming his head off. He had a bullet through his right eye which had come out under his left ear. We eventually got them both out to the road where an ambulance was waiting to take them to hospital but sadly George died during the night. Headstone of George William Trewin. Photo taken 19 February 2010.